You can find more information about the different assemblies and their dependencies in the Controls Dependencies article. The first thing you have to do is to add a reference to the Telerik.Windows.RadUploadHandler assembly in the ASP.NET application that hosts your Silverlight application. 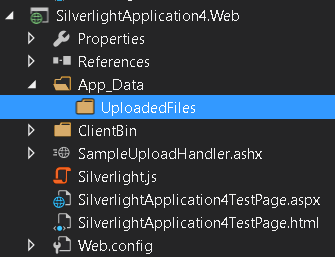 It is located in the ServerSide folder of your UI for Silverlight installation. After that create a Generic (ASHX) Handler, that derives from the RadUploadHandler class. Next, create a folder, in which the uploaded files will be stored. Please note that the target folder should be in the same folder as the upload handler. 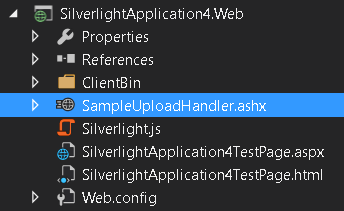 To test the handler point your browser to the SampleUploadHandler.ashx file. You should see the following output if everything is done correctly. The first thing you have to do on the client side is to declare a RadUpload control in the appropriate UserControl. Next you have to set the UploadServiceUrl property of the RadUpload. The value can be an absolute or relative url that points to the upload handler. The domain where the Silverlight application is hosted should be the same as the domain where the upload handler is hosted, otherwise a cross-domain conflict will occur. In such case you have to add a Cross-Domain Policy file to the services domain. For example, if you rely on the absolute path, the UploadServiceUrl should point to http://localhost:6519/SampleUploadHandler.ashx and the Silverlight application should be hosted on the same domain - for example on this url: http://localhost:6519/index.html. Note that the port of the application should be the same (in this case the port is set to 6519, but any other port - including the default port 80 - will work). if the path begins with "/" or "~/" then it is relative to the root of the domain where the Silverlight application had been loaded. if the path begins with "./" then it is relative to the location of the Silverlight application. if the path begins with one or more "../", then it is relative to the location above the location of the Silverlight application. The last thing to do is to set the TargetFolder property. The TargetFolder should point to the folder that is configured to accept the uploaded files. In our case the TargetFolder should be set to "UserUploads". Please note that the TargetFolder property represents the path relative to the upload handler. This is enough to make the RadUpload work. To fine tune the upload to match your application requirements, read the following topics.